No pictures found for plate number 7P68779 in California, United States. click here to add a picture. 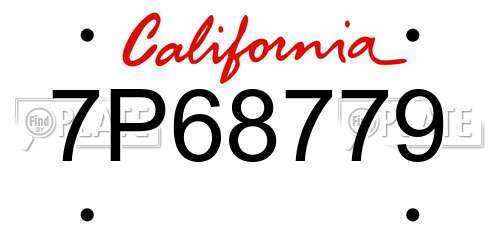 No videos found for plate number 7P68779 in California, United States. click here to add a video. No owners found for plate number 7P68779 in California, United States. click here to add an owner. No related websites found for plate number 7P68779 in California, United States. click here to add a related website. DEALERS WILL INSPECT THE ABS CONTROL MODULE CONNECTOR FOR ELECTROLYTE DAMAGE AND REPLACE THE CONNECTOR AS NECESSARY. THE RECALL WILL BEGIN ON SEPTEMBER 27, 2004. OWNERS SHOULD CONTACT DAIMLERCHRYSLER AT 1-800-853-1403. DAIMLERCHRYSLER RECALL NO. D20.CUSTOMERS CAN ALSO CONTACT THE NATIONAL HIGHWAY TRAFFIC SAFETY ADMINISTRATION'S AUTO SAFETY HOTLINE AT 1-888-DASH-2-DOT (1-888-327-4236). DEALERS WILL INSPECT THE INSTALLATION OF THE ALTERNATOR WIRE CONNECTION TO THE PDC AND IF NECESSARY, REPOSITION THE WIRE SO THAT THE CRIMP CONNECTION WILL FACE UPWARD AND TIGHTEN THE FASTENER TO THE CORRECT TORQUE SETTING. OWNER NOTIFICATION BEGAN MAY 20, 2002. OWNERS WHO TAKE THEIR VEHICLES TO AN AUTHORIZED DEALER ON AN AGREED UPON SERVICE DATE AND DO NOT RECEIVE THE FREE REMEDY WITHIN A REASONABLE TIME SHOULD CONTACT DAIMLERCHRYSLER AT 1-800-853-1403. DAIMLERCHRYSLER RECALL NO.B04.ALSO CONTACT THE NATIONAL HIGHWAY TRAFFIC SAFETY ADMINISTRATION'S AUTO SAFETY HOTLINE AT 1-888-DASH-2-DOT (1-888-327-4236). VEHICLE DESCRIPTION: CERTAIN 2500 WAGONS WERE EQUIPPED WITH INCORRECT LOAD RANGE TIRES. THIS COULD CAUSE A TIRE TO BLOW OUT IF THE VEHICLE IS OPERATED AT THE MAXIMUM GROSS VEHICLE WEIGHT. . DEALERS WILL REPLACE THE LOAD RANGE 'D' TIRES WITH CORRECT LOAD RANGE 'E' TIRES. OWNER NOTIFICATION BEGAN SEPTEMBER 24, 2001. OWNERS WHO TAKE THEIR VEHICLES TO AN AUTHORIZED DEALER ON AN AGREED UPON SERVICE DATE AND DO NOT RECEIVE THE FREE REMEDY WITHIN A REASONABLE TIME SHOULD CONTACT DAIMLERCHRYSLER AT 1-800-853-1403. DAIMLERCHRYSLER RECALL NO.995. ALSO CONTACT THE NATIONAL HIGHWAY TRAFFIC SAFETY ADMINISTRATION'S AUTO SAFETY HOTLINE AT 1-888-DASH-2-DOT (1-888-327-4236). VEHICLE DESCRIPTION: VANS AND WAGONS NOT EQUIPPED WITH POWER FRONT SEATS. IN THE PRESENCE OF ROAD SALT, WATER, AND POSSIBLY OTHER DEBRIS, THE POWER SEAT CONNECTOR LOCATED BENEATH THE DRIVER'S SEAT COULD DEVELOP A HIGH RESISTIVE SHORT CIRCUIT THAT CYCLES THE CIRCUIT BREAKER. IF THE CIRCUIT BREAKER CYCLES FOR AN EXTENDED PERIOD OF TIME, HEAT COULD BUILD UP IN THE CONNECTOR, POSSIBLY RESULTING IN A FIRE. OWNERS WILL RECEIVE INSTRUCTIONS FOR REMOVING THE CIRCUIT BREAKER FROM THE FUSE PANEL. IF AN OWNER DESIRES, THEIR DEALER CAN PERFORM THE REPAIR. OWNER NOTIFICATION BEGAN AUGUST 27, 2001. OWNERS WHO DO NOT RECEIVE THE FREE REMEDY WITHIN A REASONABLE TIME SHOULD CONTACT DAIMLERCHRYSLER AT 1-800-853-1403. VEHICLE DESCRIPTION: VANS. A SUBSTITUTE WHEEL LUG NUT TIGHTENING PROCESS MAY NOT HAVE BEEN SUFFICIENT TO ASSURE PROPER TORQUE OF THE LUG NUTS. IMPROPER WHEEL LUG NUT TORQUE COULD ALLOW A WHEEL TO LOOSEN AND CAUSE A CRASH WITHOUT WARNING. DEALERS WILL INSPECT THE WHEEL LUG NUTS FOR PROPER TORQUE AND CORRECT IF NECESSARY. OWNER NOTIFICATION BEGAN JUNE 4, 2001. ALL OWNERS HAVE BEEN CONTACTED. VEHICLE DESCRIPTION: PICKUP TRUCKS. SOUND DEADENER MATERIAL INSIDE THE STEERING WHEEL COULD BECOME DETACHED FROM THE COVER AND HOUSING. NOTE: THE RAM PICKUP TRUCKS WERE BUILT AT THE WARREN ASSEMBLY PLANT ("S" IN THE 11TH VIN POSITION) FROM MAY 16, 2000 THROUGH OCTOBER 23, 2000; ST. LOUIS NORTH ASSEMBLY PLANT ("J" IN THE 11TH VIN POSITION) FROM MAY 19, 2000 THROUGH OCTOBER 23, 2000; LAGO ALBERTO ASSEMBLY PLANT ("M" IN THE 11TH VIN POSITION) FROM MAY 23, 2000 THROUGH OCTOBER 23, 2000; AND SALTILLO ASSEMBLY PLANT ("G" IN THE 11TH VIN POSITION) FROM MAY 23, 2000 THROUGH OCTOBER 23, 2000. IMPORTANT: VEHICLES THAT HAVE ALREADY HAD THE PROPER CLOCKSPRING INSTALLED, ACCORDING TO WARRANTY RECORDS, HAVE BEEN EXCLUDED FROM THIS RECALL. IN ADDITION, 1997-2000 MODEL YEAR VEHICLES THAT HAVE HAD A SUSPECT REPLACEMENT CLOCKSPRING INSTALLED, ACCORDING TO WARRANTY RECORDS, HAVE BEEN ADDED TO THIS RECALL. WHEN THIS OCCURS, THE MATERIAL COULD INTERFERE WITH THE CLOCKSPRING RIBBON AND CAUSE AN OPEN CIRCUIT. THE DRIVER AIR BAG SYSTEM WILL BECOME DISABLED, AND THE AIR BAG WARNING LAMP WILL ILLUMINATE ON THE INSTRUMENT PANEL. DEALERS WILL REPLACE THE CLOCKSPRING ASSEMBLY. OWNER NOTIFICATION BEGAN JUNE 18, 2001. ALSO SOME 1997-200 MODEL YEAR VEHICLES THAT, ACCORDING TO WARRANTY RECORDS, HAVE HAD A SUSPECT REPLACEMENT CLOCKSPRING INSTALLED, WILL ALSO BE INCLUDED IN THIS CAMPAIGN. OWNERS WHO TAKE THEIR VEHICLES TO AN AUTHORIZED DEALER ON AN AGREED UPON SERVICE DATE AND DO NOT RECEIVE THE FREE REMEDY WITHIN A REASONABLE TIME SHOULD CONTACT DAIMLERCHRYSLER AT 1-800-853-1403. VEHICLE DESCRIPTION: QUAD CAB PICKUP TRUCKS EQUIPPED WITH A CAMPER PACKAGE AND OVERLOAD SPRINGS. THE REAR AXLE SPACER PLATE COULD LEAD TO DEFORMATION OF THE UPPER SPRING PLATE DURING ASSEMBLY OF THE AXLE TO THE VEHICLE RESULTING A SOFT JOINT. THE SOFT JOINT COULD CAUSE THE REAR AXLE U-BOLTS TO LOSE CLAMP LOAD, RESULTING IN DISPLACEMENT OF THE REAR AXLE AND A LOSS OF VEHICLE CONTROL. THIS COULD INCREASE THE RISK OF A CRASH. DEALERS WILL REMOVE THE SPACER PLATES AND THE SPRING PLATES WILL BE REPLACED. OWNER NOTIFICATION BEGAN FEBRUARY 5, 2001. OWNERS WHO TAKE THEIR VEHICLES TO AN AUTHORIZED DEALER ON AN AGREED UPON SERVICE DATE AND DO NOT RECEIVE THE FREE REMEDY WITHIN A REASONABLE TIME SHOULD CONTACT DAIMLERCHRYSLER AT 1-800-853-1403. OWNER NOTIFICATION BEGAN NOVEMBER 12, 2000.OWNERS WHO DO NOT RECEIVE THE FREE OWNER'S MANUAL ADDENDUM WITHIN A REASONABLE TIME SHOULD CONTACT DAIMLERCHRYSLER AT 1-800-853-1403.ALSO CONTACT THE NATIONAL HIGHWAY TRAFFIC SAFETY ADMINISTRATION'S AUTO SAFETY HOTLINE AT 1-888-DASH-2-DOT (1-888-327-4236). 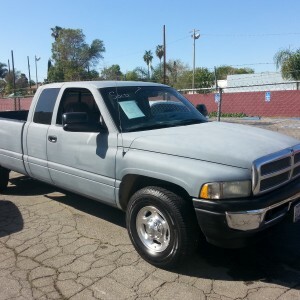 VEHICLE DESCRIPTION: QUAD CAB PICKUP TRUCKS. THE UPPER CONTROL ARMS ATTACHED WITH CADMIUM COATED NUTS CAN CAUSE THE BOLTS TO STRETCH DUE TO THE APPLICATION OF A HIGHER THAN SPECIFIED CLAMP LOAD. BREAKAGE OF THE UPPER CONTROL ARM FASTENERS COULD CAUSE THE AXLE TO ROTATE FORWARD UNDER BRAKING CONDITIONS. THIS ROTATION COULD TWIST THE STEERING LINKAGE AND POSSIBLY SEPARATE THE BRAKE LINES, INCREASING THE RISK OF A CRASH. DEALERS WILL REPLACE THE UPPER CONTROL ARM BOLTS AND NUTS. OWNER NOTIFICATION BEGAN OCTOBER 30, 2000.OWNERS WHO TAKE THEIR VEHICLES TO AN AUTHORIZED DEALER ON AN AGREED UPON SERVICE DATE AND DO NOT RECEIVE THE FREE REMEDY WITHIN A REASONABLE TIME SHOULD CONTACT DAIMLERCHRYSLER AT 1-800-992-1997. ALSO CONTACT THE NATIONAL HIGHWAY TRAFFIC SAFETY ADMINISTRATION'S AUTO SAFETY HOTLINE AT 1-888-DASH-2-DOT (1-888-327-4236).